Fully welded 0.9 mm thick steel in textured grey with a total capacity of over 1000kg. Reinforced doors in blue or grey finish with a 2-point locking system. Welded drawers on roller bearing mountings are fully divisible and have full width handles. Drawer and shelf height adjustable in increments of 20mm. Drawers are supplied separately for easy assembly. Holes are provided in the back for wall mounting if required. 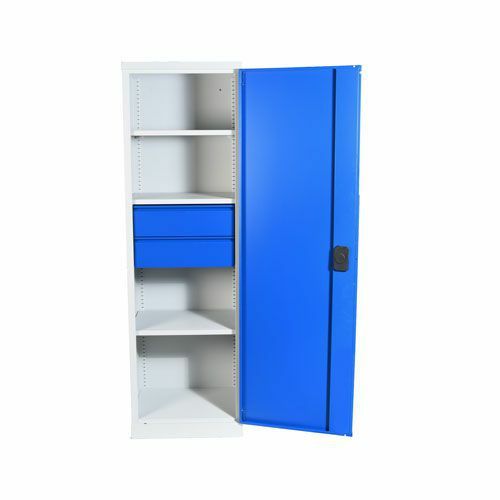 A range of high quality heavy duty cupboards specially designed to store heavy materials and tools. For use in engineering, mechanical stores and maintenance applications. For use in engineering, mechanical stores and maintenance applications.